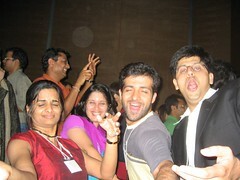 AllGoRhythms 2005, How did it go? Posted On Mon, 24 Oct 2005 08:06:00 +0000. Filed in asha, volunteer. By Vaibhav Bhandari. AshaAllgoCoordsShakingOut Originally uploaded by vbha. The photos from AllGoRhythms 2005 show presented by Asha, Seattle on Oct 22, 2005. The show was sold out and the band played bollywood masala music for about 4.5 hours and a number of once more! The audience never got enough of dance numbers!! It was lovely to see folks from all ages crowed near the stage to shake with the dhinchak zatka numbers:).